Earth Day Hooray by Stuart J. Murphy is a lesson not only in saving the Earth but also a lesson in place value. Earth Day Hooray is a part of the Math Start series of books written by Stuart J. Murphy. This is a level 3 math start book, which means the math is probably on a 1-2 grade level, but the story can be enjoyed by all. In this story, a group of kids decide to improve on their city park. They raise money for the improvements by collecting and recycling aluminum cans. They set a goal for their can collection. At first, they face some difficulty as their recycling is mistaken as trash. In the end, they are able collect, sort, and count enough cans for the money to buy flowers. Don't Let Your Recycling Become Trash! 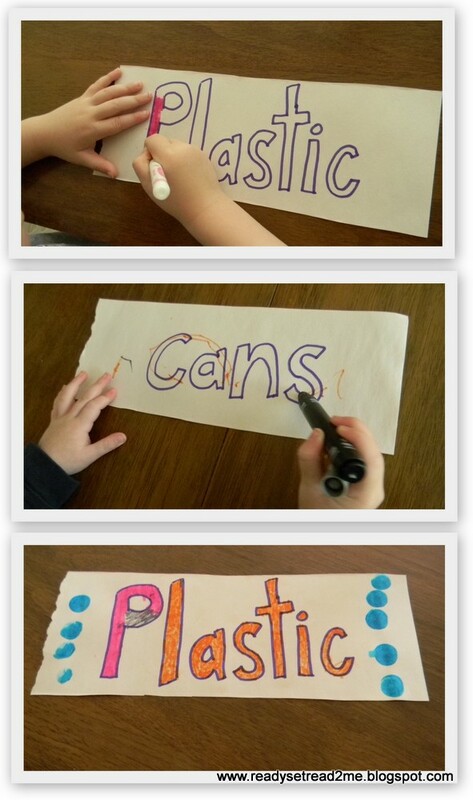 After reading the book, you could allow your child do practice writing skills by designing labels for recycling containers. Let the little writers color in large block letter labels that you have created. Let older children design their own labels. After you label the containers, why not sort your recyclables? Want Another Way to Practice Writing This Earth Day? Work together to write a pledge. Can your family recycle more? Turn off water or lights? Reuse paper or containers? Write a pledge to do more things to save the Earth. Allow your little writers to contribute the text that they can write... even if it's only signing their name (or writing the first letter in their name). Decorate it and put it someplace special! The Earth Book by Todd Parr describes simple things kids can do like using both sides of paper or turning off water when they brush, along with a description of how those things can save the Earth-- or in this case the animals habitats and the fish's water. Very simple text and bright illustrations are great for preschoolers. The Lorax by Dr. Seuss A local pollution problem presented in poetic text. The Earth and I by Frank Asch A child makes friends with the Earth but when the Earth gets sad because of pollution, the child pitches in to do something and make the Earth happy again. Check out our Trash Monsters. They've been guarding our trashcans to make sure we're not missing anything that could be recycled or reused. Also check out our Earth Day Linky. 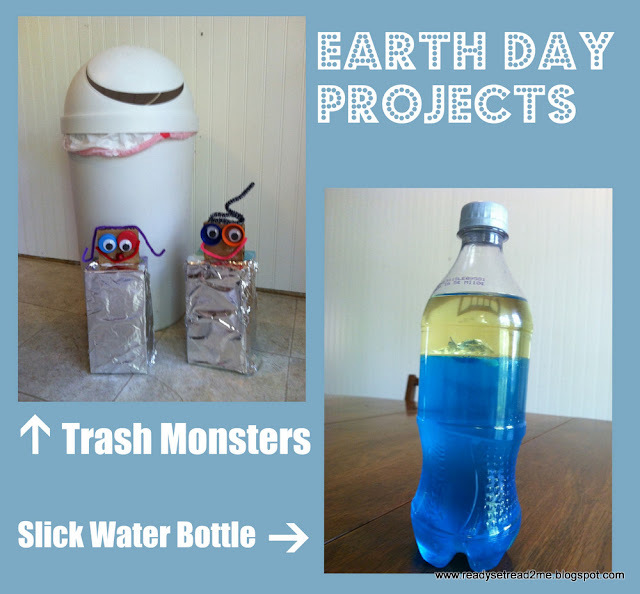 There are over 90 ideas for Earth Day Activities! You can also link up your activities. I love your trash can monsters, too! We need to look for some of those books! Great books - we read and enjoyed them all. Your writing activities look pretty good too! Never seen these books before - I think a visit to the library is sue now! I love those Math Start books! Love the trash monsters too. Thanks for sharing on Hey Mom, Look What I Did at Adventures In Mommy Land!! Hope to see you again soon! !